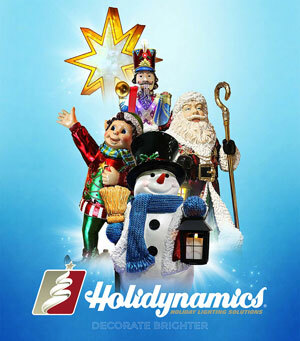 Holidynamics has been designing, producing, and supplying the highest quality holiday décor for more than 10 years. In that time, we have fine-tuned our designs and materials so that the products you display at your home or place of business will bring you years of enjoyment. We are proud to offer a wide variety of products for you to choose from. Our patented water-resistant LED Lightsets can be found on our enormous selection of indoor and outdoor décor items. From the most realistic and quality constructed Mixed Noble Series of wreaths and garlands, to the stress free assembly of our One Plug Pre-lit Trees, Holidynamics is your source for top shelf trees and foliage. We strive to offer our customers the newest and most exciting technology. Many of our products employ LED Color Changing architecture, and our NEW hypnotic Sparklers and Twinkling Trees will dazzle the eye with their gentle, random twinkling function. We are thrilled to present LED 3D Acrylic figures that glow from within, and a full spectrum of LED Tree options. Our colorful Lightdrops will soon be something that adorns your home for every holiday on the calendar. We have the entire year covered, from Christmas to the 4th of July, as well as our Summertime and Halloween series. If you want to show off your style, we have the products you need. Please explore the extensive catalog of our signature Artisticks®, Christmas Displays, 3D Holiday expressions, Trees & Foliage, and much more. From our home to yours, we present Christmas & Beyond!